What was once dubbed the New Wave of American Heavy Metal ain't so new anymore, nor is it so much a wave. The once swelling movement has lost some of its mass and momentum, as the wave (and bands) broke (up). 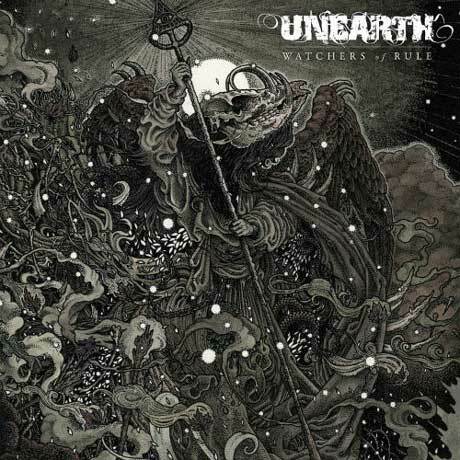 Were there a second wave, Unearth would undoubtedly lead the pack rather than ride it; the classic metalcore group are back with a new drummer, new label and new album. Fortunately, the sound on Watchers of Rule itself isn't entirely new. While every album has its unique stamp, Unearth have never dug up their sound and planted a brand new one; their latest album takes the virtuosity of The March and plays it with an intensity not found since III: In the Eyes of Fire. The result is a new permutation of Unearth, replete with pumping chugs, Iron Maiden-esque harmonic leads and some of the beefiest breakdowns this side of Y2K, best exhibited on "Trail of Fire" and "Burial Lines."